What a find. Sometimes you feel that a writer just 'clicks' with you. Not even halfway through this story, I had ordered two books by the same author. 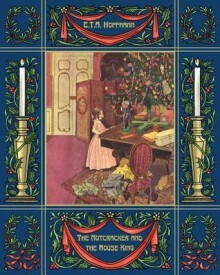 I'm so used to seeing the Nutcracker as a ballet that it comes as a big of a shock to see the story in print. (And, honestly, I'm not sure that I don't prefer it that way. )Love the Sendak illustrations. Why not, I suggest, just have them? Skip the words which feel redundant. A wordless book, maybe? There's a toy army battling a Mouse King. Okay, so it's just a dream, but I love it.